With video consumption behaviors evolving, online platforms are working to find the best way to re-direct TV viewers into their apps and offerings, in order to take a bigger chunk of the $70 billion TV ad market. None of them have been able to crack the code as yet. The idea most seem to be aligning with is that by combining the interactive benefits of social platforms with the entertainment capacity of TV-like content, they can cater to both changing viewer behaviors and the subsequent rise in 'second-screening' - viewers engaging around TV content on social apps. Twitter has been working on various tools on this front (e.g. choosing a player for the camera to follow in the second half of NBA games), Facebook has been pushing its Watch Party option to enhance immediate interaction (though there are some potential problems with that process), while YouTube has just recently announced that it's experimenting with 'Choose Your Own Adventure' type content. But what if users are less enamored with the combined capability to view and interact on one platform, and more interested in shorter, shareable episodes which they can consume on-the-go, and still feel as though they're getting the same viewing experience as traditional TV? That, at least in part, is Snapchat's contention - in a new report from The National Research Group, commissioned by Snap Inc., Snap highlights evolving video consumption trends, and how they relate to Snap's video offerings. First off, the report notes that live TV viewership is in decline, and has dropped significantly in the past few years. This is because people are no longer confined to a specific date and time to watch - in the age of Netflix, catch-up viewing, etc., viewers can watch what they want, when they want, meaning that tuning in live is no longer necessary. 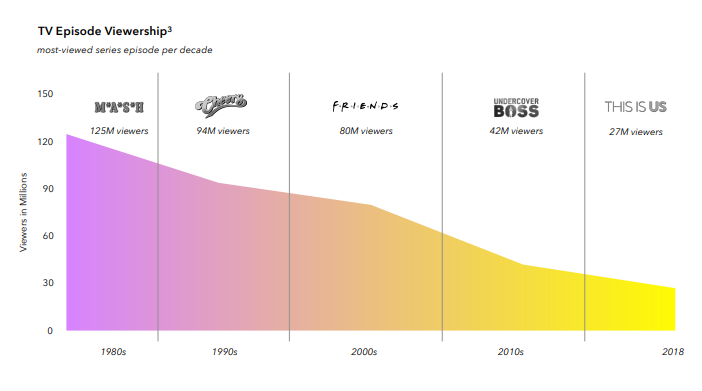 The report uses the audience numbers of major TV show episodes as an example of this, with peak audience sizes declining over time. Indeed, while people are watching more video than ever before, they're increasingly doing so based on their own schedule, when it fits into their day. Which is where the next shift comes in. According to the report, short-form video content is becoming more and more popular, particularly with younger audiences, as it aligns with both mobile viewing trends and the increased capacity to watch whenever viewers choose. "As mobile grows to be the dominant medium of consumption, content must adapt to be mobile-first. Short-form content, typically defined as content lasting 10 minutes or less, is emerging as a viable solution. Where more traditional long-form content is akin to a full meal, short-form is like an on-the-go snack: consumed alone, satiating a quick need, and bringing a little excitement to the day." Part of this shift is also driven by habitual viewing changes - as more people watch short-form video content posted in Stories from friends, for example, they're becoming more attuned to that type of condensed narrative. According to the report, 97% of respondents indicated that they watch short videos created by their friends or influencers, with 74% also watching user-generated-content daily.